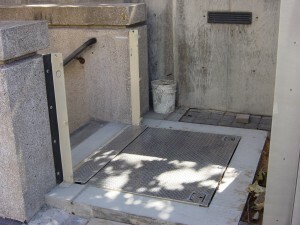 Hide your flood barrier underground – Use a Bottom Hinged (Flip-Up) Design! The most unobtrusive flood barrier is the one that you don’t see! 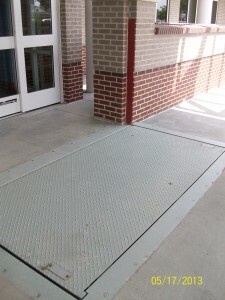 Recessed into the ground, the bottom hinged or “flip-up” flood barrier offers fast, reliable protection that can withstand even the heaviest of truck traffic. The side frames are mounted to the opening structure or posts; the panel is recessed into the ground surface within a trough. When in the lowered position, the barrier panel is flush with the ground surface. Raising the panel is done manually or with the assist of a winch. 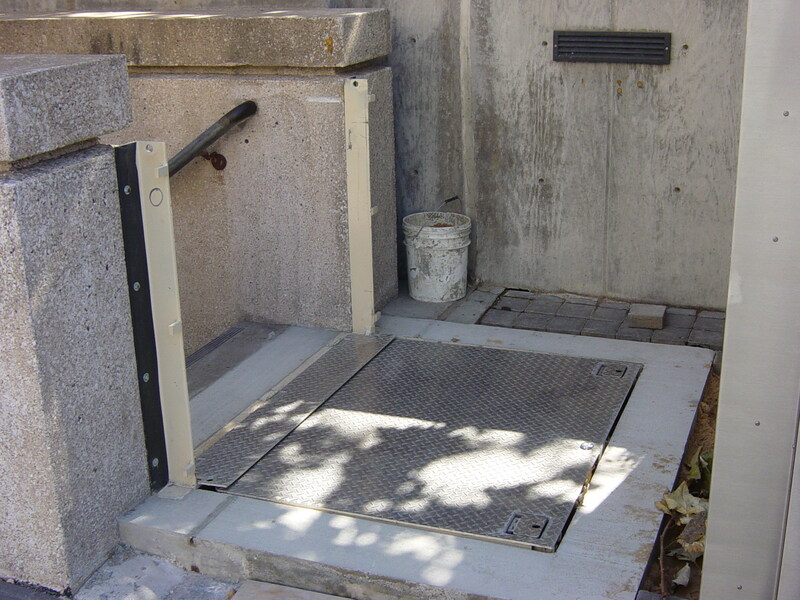 Small barriers can be manually raised & lowered; larger designs use manual or electric winches to raise or lower the panel into position. We avoid using hydraulic cylinders underneath the panel whenever possible because if they fail, it can be almost impossible to service both the cylinder & barrier if the cylinders become inoperable. Even better – for 24/7 protection, check out our new AutoRising flood barrier, which offers flood protection at pre-set water levels!